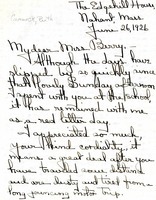 Edith L. Huher writes to Miss Berry, telling her that she learned of The Berry Schools from Mrs. Eliz. Gutknecht, who is in her Sunday School class. 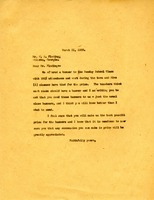 Miss Huher asks Miss Berry to send her literature to present to the Committee of the Sunday School class. 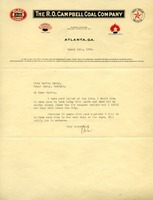 Margaret writes to Martha to let her know while she has no money to send just now, her Sunday School class was making Berry their special object of saving money to donation later in March. 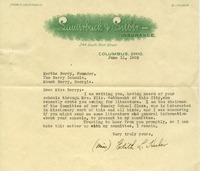 Letter from Elizabeth Mabbett asking for information on the Berry Schools and the work done there so she can share it with her Sunday school class. 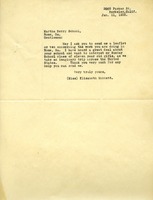 Martha writes to Mrs. Dickinson with literature about the Berry School to be used in Mrs. Dickinson's Sunday School Class. Ruth Cummock expresses her love for the Berry Schools because of her recent trip, where she met and talked with Martha Berry. 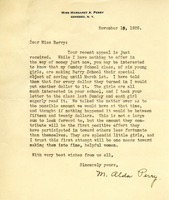 She also discusses her spreading of information about Berry to her friends so that they may also help the Schools.